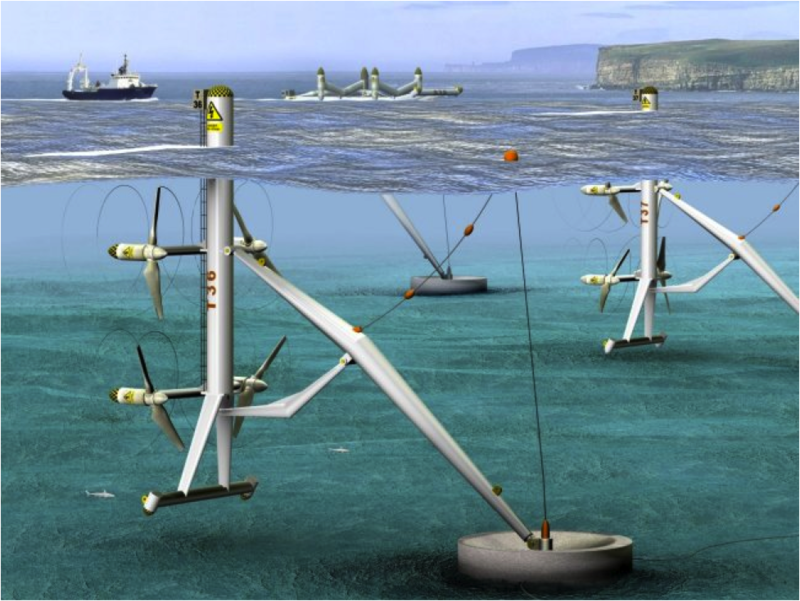 This section discusses ocean energy resources in the United States and world. Today’s world of increasing energy demands has called for us to find new and effective ways of harnessing the abundant energy resources our planet offers. For years we have heavily relied on oil, natural gas and coal to fuel our lifestyles, but it is becoming more difficult and more complex to extract these raw materials to turn into usable fuels. In the next century we will still heavily rely on these fuels, but it is important for us to find new and better ways to power our world, and it is clear that sources of renewable energy are going to become more and more important. There are many different types of renewable energy sources, and each has its advantages and disadvantages. We are going to focus on one of the more obscure forms of renewable energy, called Ocean and Tidal Energy. The world’s oceans cover nearly 70% of its surface. With this in mind, it elevates them as being the world’s largest collector of solar energy and energy storage system. Researchers believe that on any given day, tropical seas absorb 60 million square kilometers of solar radiation. This is equal in heat content to approximately 250 billion barrels of oil! Less than one-tenth of one percent of this stored solar energy, after converted into electric power, could generate 20 times the total amount of electricity consumed in the United States daily. Although the potential and supply of this energy is virtually unlimited, there are many factors that come into play when its practical use is needed. What kinds of technologies are improving the effectiveness and efficiency of this type of energy? Is it economically feasible to create an ocean/tidal energy plant where there’s an abundant source of water? How much will it cost to access the energy? Later in our discussion, we will attempt to answer these questions, as well as provide a real world perspective on the feasibility of the technology. • The huge volume of raw material (water) which can be utilized. • The number of potential sites for development. These are general considerations regarding the use of the world’s oceans and tides as a “fuel”, but they do not take into account the various advantages and disadvantages of the different types of ocean and tidal technologies. We will go into these in more detail now. The oceans are thus a vast renewable resource with the potential of producing billions of watts of electric power. 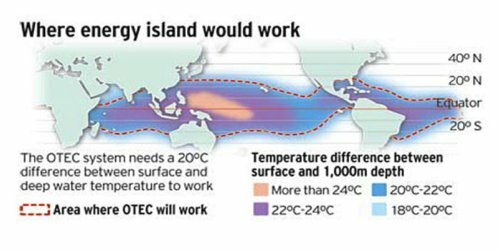 Not only does OTEC help produce energy, but the cold seawater used in the OTEC process is also rich in nutrients and it can be used to culture both marine organisms and plant life near the shore or on land. The other main type of energy generated from the seas is produced from Tidal generation. This is a process which captures the kinetic energy of moving bodies of water, converts it into mechanical energy via the use of turbines and then finally converts the energy into electrical energy. It is a process very similar to the generation of electrical energy from Wind Turbines, but with a much more reliable supply of kinetic energy (the tide as opposed to the wind). 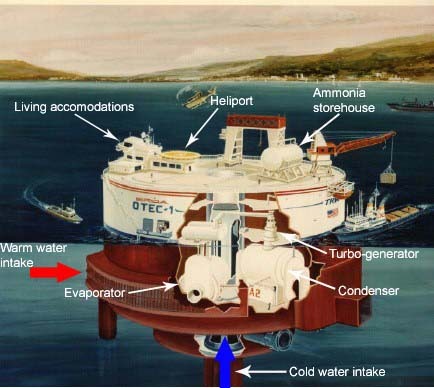 The following is an example of one of the many ways that underwater turbines can be used to harness the power of the tide. As the water moves through the blades of the turbine, the turbine spins and creates electricity. Larger scale systems can incorporate walls of turbines (called barrages) to capture a larger portion of a current’s power. Within the above links, there is information on Wave Energy, VIVACE (Vortex Induced Vibrations for Aquatic Clean Energy), Push Plates and many other technologies, as well as the names of many companies and organizations in the field. 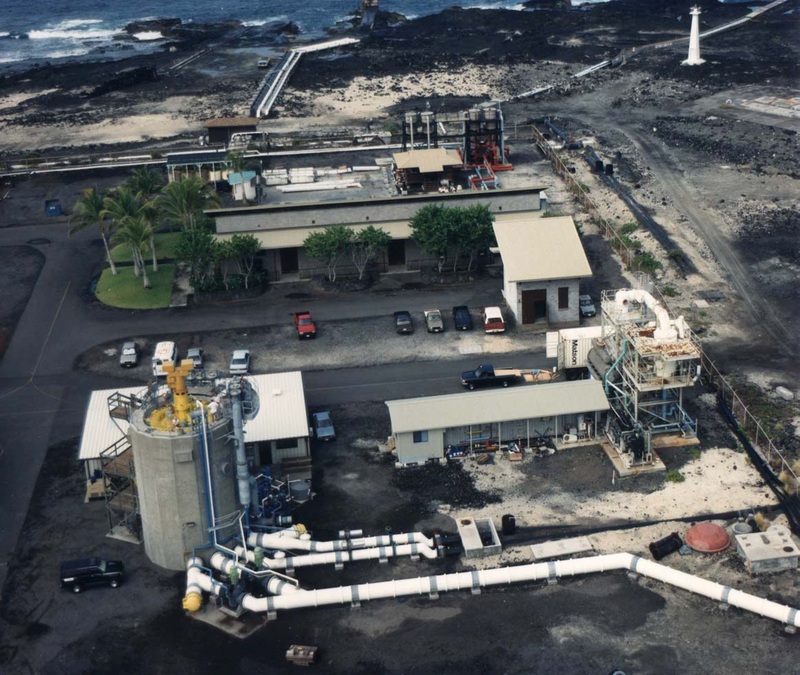 Before Oceanic Thermal Energy Conversion plants can gain the needed support, both financially and economically, a successful plant has to be built and operated. As of right now, oil and coal prices are low enough that the electricity generated through their plants is more feasible than investing in a relatively new technology. 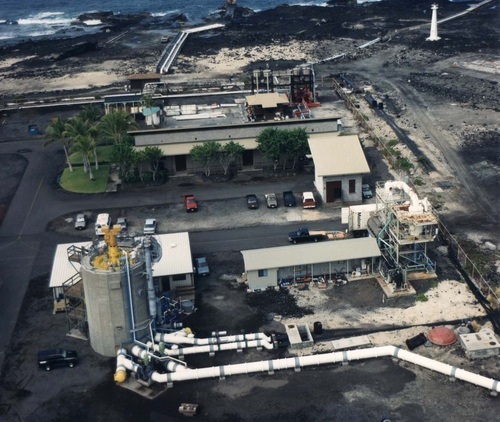 The U.S. navy and various corporations have proposed "mini-plants", and their have been many achievements in OTEC's progress, but a fully functional OTEC plant has not been built. In building an OTEC plant, investors need to be aware of the location of the proposed plant. Future OTEC sites will be most beneficial in regions of the oceans that show the most tempature range. By 2000, OTEC plants that had been produced provided 104 MW at a capital cost of over $40 billion. At the current time, the cost of building an OTEC production plant is too high because of their extreme capital costs. Part of the high capital cost is due to the fact that OTEC is a relatively new and unexplored technology, therefore, not efficient enough to be priced as a reasonable technology. As more and more experimental plants are designed in potential areas, the plant design will become more standard and costs should be lowered. Most proposed OTEC test plants are expected to provide 10-15 MW of electricity. Eventually, plants could be designed to provide up to 400 MW of electricity. Plants have been propsed at various sizes, but most test sites are expected to produce between 10-20 MW of electricity. That means that at the lower expectation of 10 MW, a plant would have to produce 50 times as must energy as the 210 kW OTEC plant pictured above. 1 Land-Based OC-OTEC with 2nd Stage Water Production. Diesel: $45/barrel, Water: $1.6/m3 Some Small Island States. 10 Same as above Fuel Oil: $30/barrel, Water: $0.9/ m3 U.S. Pacific Insular Areas and other Island Nations. This table shows the capital costs and COE for different sizes of proposed OTEC plants. These numbers were found with the assumptions that the plant was 100 MW CC-OTEC with a 10% fixed interest rate, 20 year life, and annual operational and maintenance costs were 1% of capital costs. Huge economies of scale are realized when OTEC plants with higher electricity production are produced. It is also possible to figure out how many people certain OTEC plants could provide enough energy to satisfy their needs. A rough estimate is that the electrical power needs (domestic and industrial) of each 1,000 to 2,000 people are met with 1 MW in industrialized nations. Therefore a 10 MW OTEC plant could supply electricty for 10,000 to 20,000 people. So, with roughly 300 million people in the United States, we would need at least 300 billion kW of electricity or 300 million MW. The larger CC-OTEC or hybrid cycle plantsC or hybrid can be used in either market for producing electricity and water. For example, a 50 MW hybrid cycle plant producing as much as 16.4 million gallons of water per day (62,000 m3/day) could be tailored to support a LDC community of approximately 300,000 people or as many as 100,000 people in an industrialized nation. 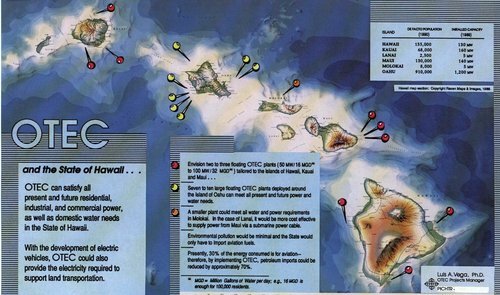 It is interesting to note the the entire state of Hawaii could be independent of fossil fuels by using large 50 MW to 100 MW offshore plants. This would require capital costs of $4500/kW and the COE would be $0.07-$0.10/kWh. Comparing the $0.21 per kWh with other conventional and other alternative energy sources shows that the electricity from OTEC is still relatively expensive. 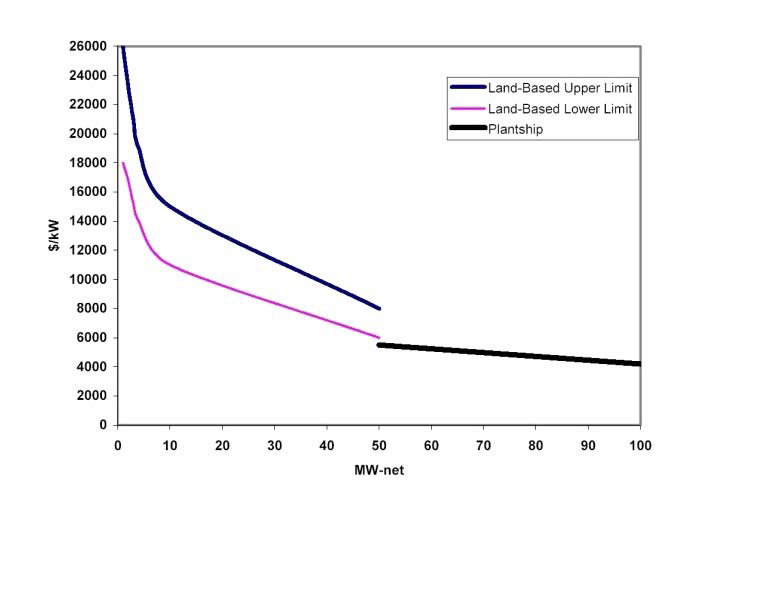 One study that shows the various COEs for energy sources shows that out of the alternative energy sources, OTEC is much higher than wind, which only has a COE of $0.091 per kWh. Tidal plants face the same financial constraints as OTEC plants. With such high capital costs, tidal plants will need to source their funding through government programs. Even though it is lest costly to start a tidal plant, you can still see that it is relatively more expensive than other renewable energy sources. Another issue that hurts tidal energy's growth is the fact that investors do not admire the long payback period tidal energy promises. The COE of Tidal is less than OTEC, but still not low enough to be competitive with energy from typical energy sources like coal and natural gas.